What does early childhood activism mean or look like in different political, geographical and cultural contexts? 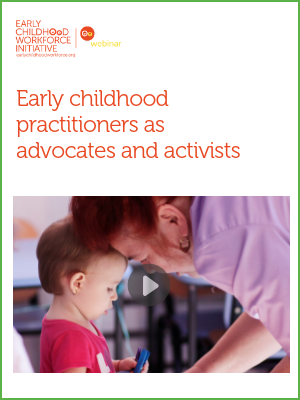 Are advocacy, activism and the ability to effect positive change essential elements of professionalism in general, and therefore the early childhood profession in particular? Is it reasonable to expect early childhood practitioners to balance an activist critical stance alongside other roles such as pedagogical expert; builder and maintainer of relationships with children, their parents and other professionals; as well as manager in return for little recognition and poor remuneration? The webinar is primarily intended for early childhood practitioners, leaders in early childhood services and lecturers/trainers teaching pre-service and continuing professional development courses on leadership, professional practice in the early years, working with families with young children and social policy. It is also beneficial to those who represent the interests of the early childhood workforce (trade unions, professional councils, representative bodies) at national and international levels.To listen to the webinar recording, click the YouTube link below. To access resources and presentations related to this webinar, visit the webinar webpage.